We have wholesome diary for your family. Dairy does the body good! 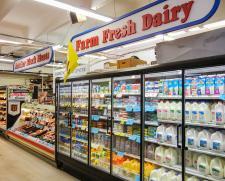 Amongst our many dairy items, we also bring in Dimock products to add to the dairy options. Variety cheese, flavored cheese, butter and cheese spreads are made by hand in Dimock South Dakota. We are happy to have Dakota Layer eggs out of Flandreau S.D. as our supplier for fresh large grade AA eggs. We also feature Omega Eggs from local Garretson farmers Arlan and Darwin Veldkamp. At holiday time, come in for some Lefse! Please call us or let us know and we will try to find it for you. Click here to send GFC a message.